Climb cracks up the middle of the First Tower of Fate. The route’s lower half faces southwest. The route’s upper half faces south. This is a committing adventure because the season for climbing this wall is during the shorter days of the year and there are few fixed anchors for retreat. On Pitch 9, run out steep slab climbing to the left of the thin crack avoids the C2. Descent: descend the gully/chimney system (“The Big Mamma Slot”) immediately east of the route on all natural anchors. 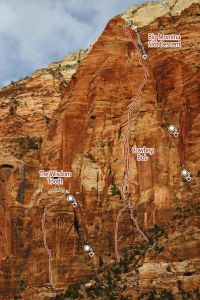 Which SuperTopo guidebooks include a topo for Cowboy Bob Goes to Zion?